LOVE IT! I’ll make sure to print it out for my DMs binder and check it every time I have to run a game. Nice. Hmm… *rolls 1d20 and gets 11* Oh, that’s an easy one. Yes, abso-bloody-lutely. It happened the session before last. Pit viper bite. I’ll try and answer the other nineteen questions on my blog later. Do I get any benefits for wearing a helmet? No and I need to come up with something! Will we need to run from some encounters, or will we be able to kill everything? Yes and often — feet don’t fail me now! Can I buy magic items? Oh, come on: how about just potions? Potions to a limited extent and occasionally something else here or there, but definitely no shops! Interesting answers. How do you award experience for magic? Some amount of points every time you get off a spell? Solving a problem with a spell? By “magic” I just meant magic items – the standard DMG awards for stuff. I’ve awarded bonuses for particularly impressive roleplaying or creative problem solving in the past, but these days I’m fairly by the book on XP. I just posted my answers here. Ability scores generation method? 3d6 x7, assigned as you roll (after each roll, so if you want a fighter and put a 16 in STR and later roll an 18, too bad. Any roll (why I require 7 rolls), at any time, may be assigned to GPx10. How are death and dying handled? Some are buried, some burned, some mummified… Seriously though, once HPs = 0, damage goes straight to abilities, which is a bear to heal! What about raising the dead? On a litter, maybe lashed to a pole, or even a spire. Have considered only allowing name level characters this benefit. But mostly, dead is dead. How are replacement PCs handled? Either freshly rolled (1st level only) or you flesh out a hireling (obviously lower level than PCs as they get less XP), so treat ’em well and keep them alive, you may be one of them! Are there critical hits and fumbles? How do they work? Yes, crits on 20 minus your Attack Bonus, that go straight to targets Ability Score. Fumble on a 1, I get to be creative. Do I get any benefits for wearing a helmet? Yes, I play with Death and Dismemberment (http://trollsmyth.blogspot.com/2008/06/playing-with-death-and-dismemberment.html) which happens with Ability Damage rolls. Can I hurt my friends if I fire into melee or do something similarly silly? Sure, on a fumble, and Criticals can be rolled on them too. Will we need to run from some encounters, or will we be able to kill everything? What is a fair fight (CL)? You had better beat feet if you think you might be out classed. Level-draining monsters: yes or no? Yes, but at this time, not sure how I would do it. Semi-permanent Ability Score loss perhaps? Are there going to be cases where a failed save results in PC death? Yes. How strictly are encumbrance & resources tracked? Not. If it sounds reasonable I let it go. If it doesn’t then I might do a quick tally. What’s required when my PC gains a level? Training? Do I get new spells automatically? Reflection. Sometimes. No. Can it happen in the middle of an adventure, or do I have to wait for down time? Yes, mid-adventure is feasible. What do I get experience for? Doing damage, survival (adventure completion), carousing, good role play. How are traps located? Description, dice rolling, or some combination? Combination? Description will find them alone, a secret DM die roll might too depending on what the PCs are doing, or not doing. Are retainers encouraged and how does morale work? Encouraged, and 2d6+CHA check. How do I identify magic items? Use, Spells, or investigation. Can I buy magic items? Oh, come on: how about just potions? No, and no. I run very low magic games. Even magical PC better keep their head down and their head cloaked. Can I create magic items? When and how? Yes, and when you figure out how or are taught. This is an adventure in and of itself in my book. What about splitting the party? Sure, as long as you realize it will slow the game down and cause you to run twice as fast in game. This took longer to finish than I thought so I’ve posted mine over here. Going to answer now. You’ve cause a tidal wave of 20 questions. I know right? Step away from the internet for a couple of hours and look what happens. Nothing revolutionary, but the answers are up on my blog. Great thought exercise. Answers here – thanks, Brendan. You get XP for killing, theft, drinking heavily, and seeing/doing new stuff. The last is in accordance with Jeff Rients’ XPloration rules. I can only hope this is inspiring people to crib their own versions of the rules (i.e. 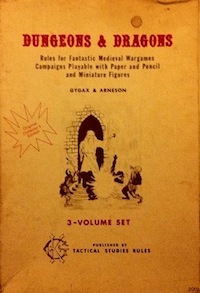 their own version of “D&D Mine”). I saw this on Bat in the Attic and Daddy Grognard, and was inspired to answer them about Gods & Monsters. Great questions. 1a. Can a set of ability scores be determined to be “hopeless”? 21. How are initial hp determined? 4a. And at what level or experience total do replacement PCs begin? 17a. And how are magic items differentiated from mundane items prior to identification? Just answered over at my blog. Okay. We posted our answers at our blog. Good questions. Jeff sent me. Thanks for coming up with these! Gives me another list to consider for my planned FLAILSNAILS game. You know we played in the Tower of Zordaz game together last Sunday right? I played the elf (Aurak). I finally got around to answering (and the answers raised more questions for me to look into). You can read it at a 20 Quick Questions: Rules (KJD-IMC). Thanks for the heads up. Added your responses to the relevant posts.